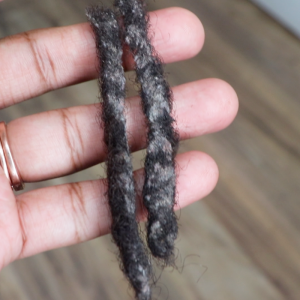 I have received numerous questions about the best way to prevent locs from tangling together when you’re not retwisting often — the solution is Loc Popping. 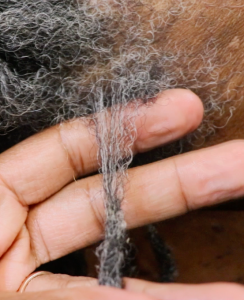 Loc Popping — A technique to effectively separate locs that have meshed or tangled together without causing any damage to the locs. The technique of Loc Popping, or separating the base of the locs, can be done with Traditional locs, Sisterlocks™ and Semi-Freeform locs. The only type of locs that do not, or should not, use loc popping is freeform locs because that would disrupt the organic growth of the locs. I personally have been popping my locs since my first set of locs, because it ensures that the locs do not fuse together. You only want to pop your locs when they are wet. The most ideal times would be right after shampooing your locs or after misting your hair with your daily refresher. NEVER separate your locs while they are dry. Wet hair is more pliable and elastic than dry hair which will minimize any discomfort and reduce breakage and/or thinning of the locs. How Do You Pop Your Locs? Loc Popping is a great technique to master, especially with the #NuGrowthChallenge in full effect, to keep your roots looking fresh with defined parts and it’ll help to prevent your locs from tangling together. How Often Do You “Pop Your Locs”? You said “pop your locs” 12 times. I was WAITING for this! Wondering how to survive this challenge for 30 days since my hair grows really fast! Yay! I’m so glad it helped you! – This is definitely a MUST when you don’t retwist. This was very helpful information Jocelyn, is it safe to cut the joined locs. Just wondering I don’t want to do any damage. I wouldn’t cut joined locs with scissors, instead if they are truly fussed to the point where you can pull them apart, use an eyebrow razor to separate them. This is a more natural way to disjoin locs. Just watched this after your latest mailer in 2017…. After you pop them, what do you do with all that loose hair (if you are not retwisting)? In your video, you just left them as is, but for me, those hairs would IMMEDIATELY start tangling up where they are not supposed to be again. I wrap them around the locs they belong too, but that only last for a hot minute before they are at it again. I’m 23 months in 2 days, and still having this tangling problem. Any suggestions? You may also need to incorporate a little bit of loc rubbing after you wrap the loose hairs around the loc to get them to stay in place. If that still does not work your best bet will be a crochet session to bring in all the loose hair permanently. Please don’t do this to Sisterlocks! Getting your Sisterlocks re-tightened on a regular basis will alleviate the growing together of the Sisterlock. Please, always ask your consultant first. Protect your investment! This is exactly what they teach you to do for the care of your Sisterlocks after every shampoo. I am a Sisterlocks Consultant, so I am aware of the care regulations. I’m currently trying to start my dreads out but I’m having problems with growing dandruff any suggestions on how to keep my scalp healthy without harming my locs? I am so glad I found this video! My loctician recently popped my locs during my first retwist and I now have a very sore scalp. I’m trying to learn how to maintain my own hair so that I can take care of it myself from now on. I am so sorry that you had this experience! Coming from someone who is super tender-headed, I would never go back to the salon either! Here is a link to an online workshop that I teach, that will educate you on everything you need to know about maintaining locs at home, “How to Retwists Locs at Home“. This was very helpful. 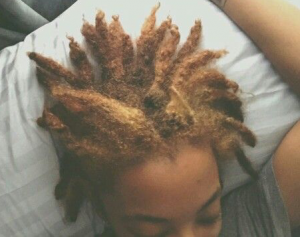 I was confused about semi free forming and how often to separate my locs. Thanks for links on loc popping and base wrapping too! Your blog has been a godsend for me! Yay! I am so glad that the information has been helpful for you!